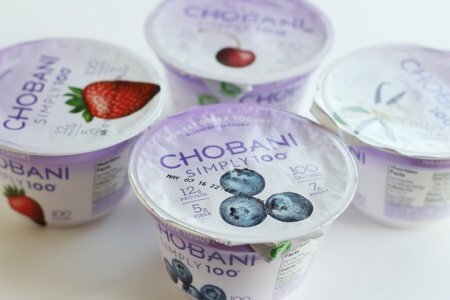 Chobani Simply 100: Friend or Foe? Chobani is the yogurt we all should love. Look at that packaging! I had the pleasure of meeting the marketing team and seeing a Chobani yogurt plant in upstate New York. It is an incredible operation that gave me new respect for what it is to be a food company – especially one that works with a perishable product. Since that meeting, I haven’t heard from Chobani much because I wasn’t very nice. They asked me what they could change to make their product more healthy and I told them to cut the sugar (rather vehemently). I’ve been on a couple of trips to big food companies and every time I end up being very hard on them. And, unlike Oikos Triple Zero, there is fruit in the ingredients. They are using stevia leaf extract and monkfruit extract to ensure that the yogurt is sweet enough without the extra 5 grams of sugar they usually add to their regular products. Nonfat Yogurt (Cultured Pasteurized Nonfat Milk, Live and Active Cultures: S. Thermophilus, L. Bulgaricus, L. Acidophilus, Bifidus and L. Casei), Chicory Root Fiber, Strawberries, Water, Banana Puree, Evaporated Cane Juice, Natural Flavors, Pectin, Locust Bean Gum, Monkfruit Extract, Fruit And Vegetable Juice concentrate (For Color), Stevia Leaf Extract, Lemon Juice Concentrate. Contains Milk. Because inulin is a natural ingredient, I believe there is no warning on products that contain it. Maybe there should be because many people have a not very fun issue with it. It is a little sad that we need to be so aware of every new ingredient that is added to our food. This type of thing motivates me to stick to the “less than five ingredients” rule about processed food. My take on Chobani 100 is that it is almost entirely the same as Dannon’s Oikos Triple Zero except for taste. I found the fruit Chobani flavors to taste like soap. There was a floral thing going on that reminded me of sucking on a Dove soap bar. Also, I tasted that bitter kick from the stevia that I hate. Chobani 100 tasted medicinal to me and after trying 4 flavors, I tossed it all out. Food, even when you are trying to cut back, should be pleasurable. You should grab your container off the shelf and be excited about having your snack. It shouldn’t be a form of punishment because you gained 10 pounds last year. My advice (broken record here) is to buy plain yogurt and mix in fresh fruit or a little of your favorite jam. This will taste infinitely better than Chobani 100. Please try the new Chobani Simply 100 Chocolate Strawberry Flip...love to hear what you think of it. Chobani 100 is one of the only lines of yogurt that does not bother my stomach. I just can't understand why anyone one needs to sweeten yogurt. Add some fruit a few bits of granola if you like it and away you go! Perfect little snack. Plain greek yogurt with pureed mango is delicious. The mango puree is also tasty on cottage cheese. @Laurel - I will take a look at the new Chobani 100 flip. Thanks! Thank you for alerting people, Lisa! I always appreciate your reviews. I will steer clear of this one. You are so right, plain yogurt with fruit is much better. Yes I noticed the same thing, but I like them, so I don't care. I have never had a stomach issue when I eat them. I love the prebiotic fiber-chicory root fiber! Perhaps the problem comes from trying to whittle a healthy product down to 100 calories? I'm eating Zoi plain full-fat yogurt as we read this. I ran to check the ingredient list: no inulin. I added muelsli, walnuts and raisins, which probably brings the calorie total to 350ish, but it's my breakfast, so that's fine. Thank you for this fabulous post! Just shared it with my WW leader. I stopped eating Chobani a loooong time ago, back before this Chobani 100 came out. I used to eat the other types of Chobani and hadn't bothered to look at the sky high sugar count. Once I found out, I kicked them to the curb! I love the Chobani products! I was having consistent bowel issues. My doctor recommended a higher fiber diet and more cultured products (probiotics). When I first increased my fiber intake, I notice some bloating and discomfort (from any fiber source). It took me about one week at increased fiber levels for my system to adjust to it. Any discomfort was temporary and completely went away. Due to my lifestyle, it was difficult to add enough bulk fiber to my diet and that's when I discovered inulin as a great natural (soluble) fiber source and I consume many products that have it. Inulin is also a prebiotic fiber and has many proven gut health benefits. I have noticed a significant positive change in my health since increasing dietary fiber and adding inulin to my diet. I actually have that same gassy problem with stevia - I HATE it!!! I can immediately taste its nasty aftertaste and it gives me horrible stomach problems - so don't just jump on the fiber - it might not be the problem! So, I make my own (non-dairy) yogurt with soy milk and non dairy culture. I started doing this, although it's not entirely practical, because of all the additives in commercial brands. I decided to check on line for ingredients in some of the more healthy dairy yogurts and here they are, "Milk Non-Fat Pasteurized Cultured, Contains Live Active Cultures : S. Thermophilus, L. Bulgaricus, L. Acidophilus, Bifidus, L. Casei." So, if I ate dairy yogurt, these are the ingredients I'd be looking for. Try Quark. It is a lot more expensive but only 2 WW points. Tastes really good. Some people, not all , react and have digestive issues from foods high in FodMaps -chicory,insulin,and many sugars and vegetables and fruits.Anyone that has this problem has to be careful with these and fiber. So it isn't always that someone needs more fiber. Not all people are the same. It can make you very sick if so. If you have IBS and other digestion health issues take a look at The LowFodmap diet. Saved me from a lot of misery. It isn't that any food is bad, it just may no agree with some.
" inulin " Not insulin ( spell correct is not always correct) !